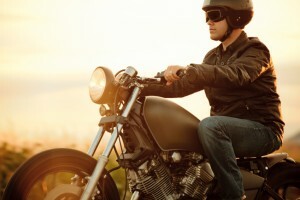 Motorcycles and two-way radios go together great. When you are on the back of a bike it’s not easy to communicate, using a cell phone is almost completely out of the question because you must stay in control of the bike while sending and receiving messages. Maintaining control of the bike also limits your ability to use hand signals, plus you are not always communicating with people in your line of sight. Whether you are traveling in a group of other motorcycle riders or trying to communicate back to a main station, two-way radios offer the perfect solution. When shopping for a two-way radio for motorcycle usage there are unique qualities you want to be on the lookout for in order to get the most out of your device. Here are 7 things you should consider before buying or renting a two-way radio for motorcycle. Riding a motorcycle requires your full attention with eyes on the road and both hands on the handlebars. This can make it difficult to safely communicate using any handheld device. 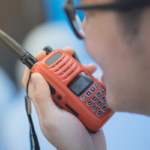 As a result, a two-way radio with quality headset support available will help you communicate with ease. Not all radios have the best compatible headsets on the market, which is why it’s important to do your research and find a radio with adequate headset options. Headsets come in numerous styles, functions and price points, finding one that works well while out on the road will protect you and your team’s safety. It will also ensure you can communicate hands-free at any time. 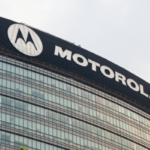 Two-way radio range becomes more important when you are using radios to communicate between motorcycles. Motorcycles are fast traveling and usually used to travel more than 5 to 10 miles, therefore you are going to need a radio system capable of communicating across vaster distances. Also, if you are communicating between other bike riders you will need a greater distance of range. Say for instance one biker becomes stuck at a stoplight while the others move ahead. Having adequate radio range prevents a lot of potential problems from cropping up. We offer Wide Area two-way radio range, giving you the chance to communicate clear across county boundaries, as much as 300-miles apart. 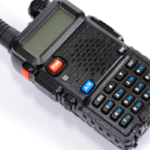 This new radio technology presents a world of opportunities regarding radio communication. If you plan to go for a long drive you need your two-way radio to remain charged the whole time. If your battery is short-lived it’s going to be difficult to rely on your radio throughout your travels. Unlike automobiles, motorcycles don’t typically come with power outlets meaning it’s impossible to charge your radio on the go. Seek out radio models that offer the longest battery life, and/or models that offer the option to pop in a few AA or AAA batteries if you get into a bind. Having access to weather via your two-way radio is a great perk if you are out on the road. In fact, it can make the difference between driving through a rainstorm and taking a different route. The weather impacts everything you do and yet is often unpredictable. Knowing the current and upcoming weather conditions as you go about your day can be very useful, especially when you are unprotected from the elements on the back of a bike. A two-way radio with GPS is not necessary for all but it might be just what you need. If a motorcycle does not have its own GPS system a two-way radio with this functionality will be a great asset to ensuring you don’t get lost. Also, this allows team members the ability to track one another at all times, increasing productivity and communication. Two-way radios used on motorcycles must endure the elements; after all you never know when you are going to find yourself driving through a dust cloud or rainstorm. Having a durable two-way radio that is capable of standing up to these elements is very important. Otherwise, you might end up with a fully charged radio that is unusable because of exposure to dust or water. Talking between radios while out on the road isn’t easy thanks to all of the road and wind noise surrounding you. A radio that has poor to moderate speaker quality is going to make efficiently communicating much more difficult for you and your team. Having a radio with strong speaker quality will make your life easier and your conversations much clearer. 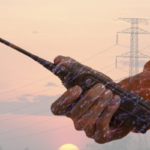 Highland Wireless is a leading certified provider of two-way radio systems and services. Contact us today to learn more about the best two-way radios for motorcycles.